For other uses, see Calaveras (disambiguation). A sugar skull, a common gift for children and decoration for the Day of the Dead. A calavera [plural: calaveras] (Spanish -pronounced [kalaˈβeɾa] for "skull") is a representation of a human skull. 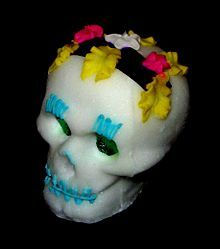 The term is most often applied to edible or decorative skulls made (usually by hand) from either sugar (called Alfeñiques) or clay which are used in the Mexican celebration of the Day of the Dead (Día de los Muertos) and the Roman Catholic holiday All Souls' Day. Calavera can also refer to any artistic representations of skulls, such as the lithographs of José Guadalupe Posada. 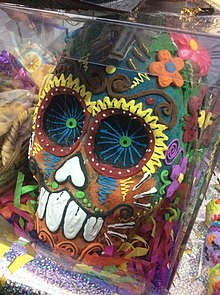 The most widely known calaveras are created with cane sugar and are decorated with items such as colored foil, icing, beads, and feathers. Traditional methods for producing calaveras have been in use since the 1630s. 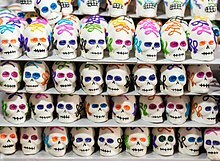 The skulls are created either for children or as offerings to be placed on altars known as ofrendas for the Día de Muertos which has roots in the Aztec, Mayan, and Toltec cultural celebration of the Day of the Dead. The tradition of sugar skulls is for families to decorate their loved ones' ofrendas with both large and small handmade sugar skulls. Children who have died, represented by small sugar skulls, are celebrated on November 1. The larger sugar skulls represent the adults, whose celebration takes place on November 2. It is believed that the departed return home to enjoy the offering on the altar. In pre-Columbian times the images of skulls and skeletons were shown often in paintings, pottery, etc. representing rebirth into the next stage of life. During the 20th century a political caricaturist named José Guadalupe Posada became famous for making Calaveras as vain skeletons dressed in the clothing of the wealthy. The most famous one was Catrina, wearing a feathery hat, fancy shoes and a long dress. Catrina is considered to be the personification of The Day of the Dead. These skeletons are created from many materials such as wood, sugar paste varieties, types of nuts, chocolate, etc. When used as offerings, the name of the deceased is written across the forehead of the skull on colored foil. Traditional production methods have been in use since roughly the 15th century. The process involves using molds to cast the calaveras. Production can be a lengthy process: a craftsman will usually spend roughly four to six months producing the skulls for a season. 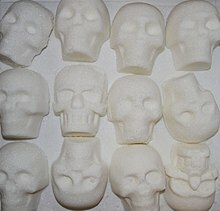 Traditionally made sugar skulls are considered folk art and are not meant to be consumed. The production process is more focused on the aesthetic appeal of the skull than on the taste or food safety of the product. Furthermore, many calaveras feature inedible decorations, such as beads, feathers, and foil. Some skulls were formerly decorated with sombreros, though these designs have mostly disappeared since the 1970s. 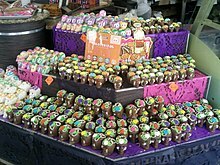 The calaveras are then traditionally sold at outdoor market stalls beginning two weeks before the Day of the Dead. Other calaveras are produced to be edible. Most are cast as one piece from cane sugar (which can either be left unflavored or flavored with vanilla). Other calaveras may be made from chocolate. The calaveras are typically colored with vegetable dyes. Like the more decorative calaveras, these will sometimes have names written on the foreheads as well. Calaveras may be eaten, or kept for a few days and then thrown away. Clay toy variations of calaveras also resemble the shape of human skulls. These toys are often painted a metallic silver color, but they may also be found in colors such as white, black, and red. Beaded eyes of many colors may also be added for decoration. Poetry written for the Day of the Dead are known as literary calaveras, and are intended to humorously criticize the living while reminding them of their mortality. Literary calaveras appeared during the second half of the 19th century, when drawings critical of important politicians began to be published in the press. Living personalities were depicted as skeletons exhibiting recognizable traits, making them easily identifiable. Additionally, drawings of dead personalities often contained text elements providing details of the deaths of various individuals. Sometimes known as "sugar skull" make-up, or Catrina make-up, facepainting a skull with ornate elements is a popular element of Day of the Dead celebrations in Mexico. Its use as a Halloween costume has been criticised as cultural appropriation. Girl has face painted in Mexico City, celebrating Day of the Dead, circa 2014. People photographed in Mexico City, celebrating Day of the Dead. Girls with sugar skull make-up photographed in Mexico City, celebrating Day of the Dead, circa 2014. Girl with sugar skull make-up photographed in Mexico City, celebrating Day of the Dead, circa 2014. Man with sugar skull make-up photographed in Mexico City, celebrating Day of the Dead, circa 2014. ^ About an José Guadalupe Mexicano Posada's Calavera Revolucionaria, Chicana and Chicano Space, retrieved 19 June 2018, Posada created many images of calaveras (skeletons) performing many different human activities. These images were/are used for the Day of The Dead celebrations in Mexico. ^ a b c "Day of the Dead ~ Frequently Asked Questions". www.mexicansugarskull.com. Reign Trading Co. Retrieved 19 June 2018. ^ a b Turim, Gayle (2 November 2012). "Day of the Dead Sweets and Treats — Hungry History". History TV. Archived from the original on 10 March 2018. Retrieved 19 June 2018. ^ Chef, Katelyn (28 October 2016). "A Sweet History of Sugar Skulls on Day of the Dead". Martha Stewart. Retrieved 19 June 2018. ^ Gavrilova, Anabela (12 August 2013). "Sugar Skulls' status in popular culture: What is their meaning and where do they originate from?". Cruel Daze of Summer. Retrieved 19 June 2018. ^ Detetedemort.online, FR. "learn more". ^ Brandes, Stanley (8 January 2007). Skulls to the Living, Bread to the Dead: The Day of the Dead in Mexico and Beyond. Wiley-Blackwell. p. 43. ISBN 978-1-4051-5248-8. ^ Rangel, Sonia. "Calavera poetry reading slated for Nov. 1". Tejano Tribune. Archived from the original on 28 July 2009. Retrieved 19 June 2018. ^ Barradas, Francisco (1 November 2007). "Calaveras and Posadas". El Tecolote. Archived from the original on 19 November 2007. Retrieved 19 June 2018. ^ a b Devash, Meirav. "5 Things to Know Before Doing Dia de Los Muertos Makeup". Allure. Retrieved 2018-10-07. ^ Bachman, Stephanie. "The Origins of Sugar Skull Facepaint: Day of the Dead". Retrieved 2018-10-07. ^ "3 Ways Not to Be a Culturally Appropriating Jerk This Halloween". Marie Claire. 2017-10-03. Retrieved 2018-10-07. ^ "Appreciating, Not Appropriating, the Day of the Dead". The American Word. Retrieved 2018-10-07.